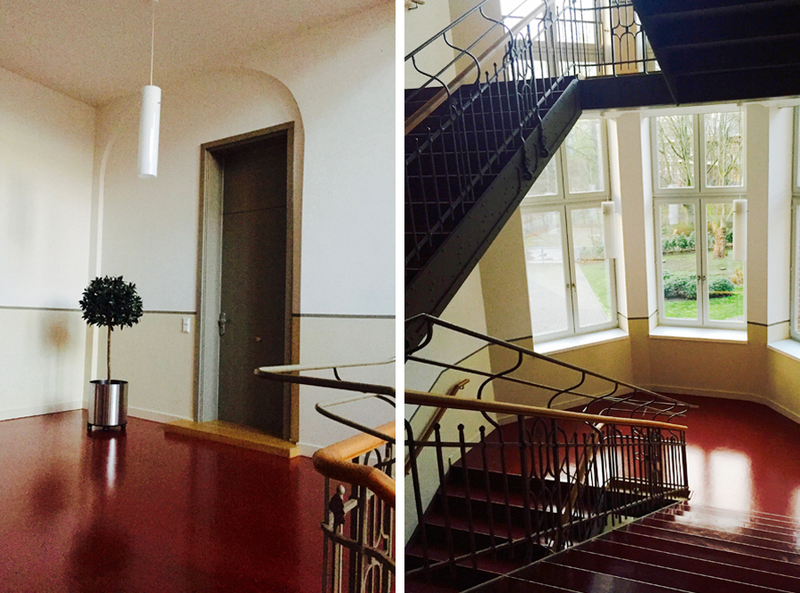 My client and her husband had recently moved into a fabulous converted office building. 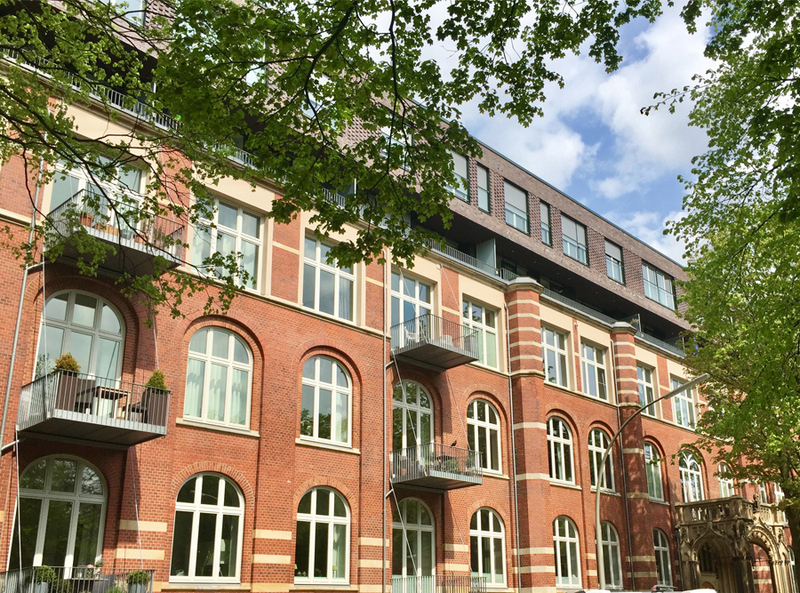 Up to that point, I was stunned by the highest celings I had ever seen in an apartment building! Nearly 4 metres and made the whole space feel enormous. What was missing though was an intimate cosiness, a splash of colour and a pinch of humour. The ingredients for the perfect apartment for two. We wanted to stay away from the clinical white tone that the whole apartment had and decided on a dark grey which would bring down the high ceiling and create more intimacy. We chose a Brillux tone Grain de Poivre (peppercorn). The elegant palette was incorporated into the whole apartment from floor to just below the ceiling. To add glamour and old-new elements we added art noveau mouldings and then we came to the topic of wallpaper. The kitchen was sleek and modern and but clients felt it lacked a certain something. Humour! 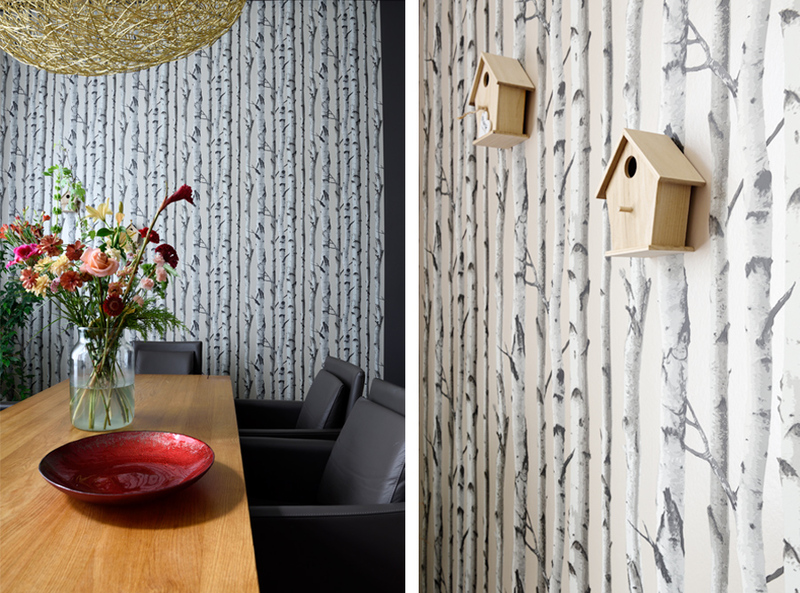 They had falled in love with the infamous birch tree wallpaper and simply had to have it. But instead of papering the whole space I suggested taking one wall in the dining area. They went for the idea and to finish off the wall we added two small wooden bird houses nestles within the wallpapered branches! To top off the sleek yet 'woodland' kitchen, golden elements were added in the form of a large wire ceiling light, loving named the golden potato and a baroque style mirror. They brightened and lightened up the darker areas of the kitchen. The finished result was truely stunning. We also made sure that we made good use of the textures, furniture and fittings that were already available. Beautiful interiors doesn't have to mean throwing everything away. The simplest tricks like reaaranging furniture, switching curtains or cushions around can save time money and frustration. We kept the simple white curtains which let in lots of light and harmonised perfectly with the patterns in the colouful cushions and artwork. We didn't want to go too overboard with pattern and fabric but create a good mood relaxed feel. 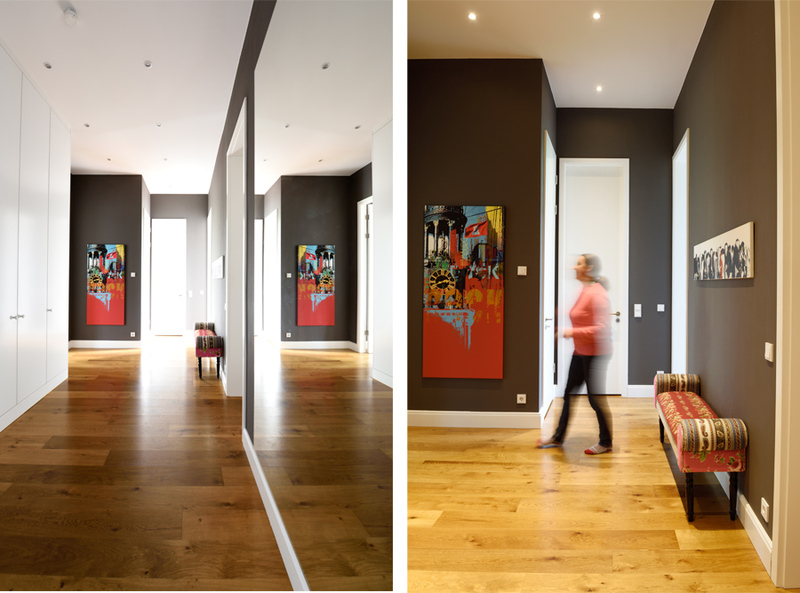 The artwork gave the whole apartment a friendly and open feel and with the help of the mirror enlarged the hallway and used the available light more effectively despite the dark walls. 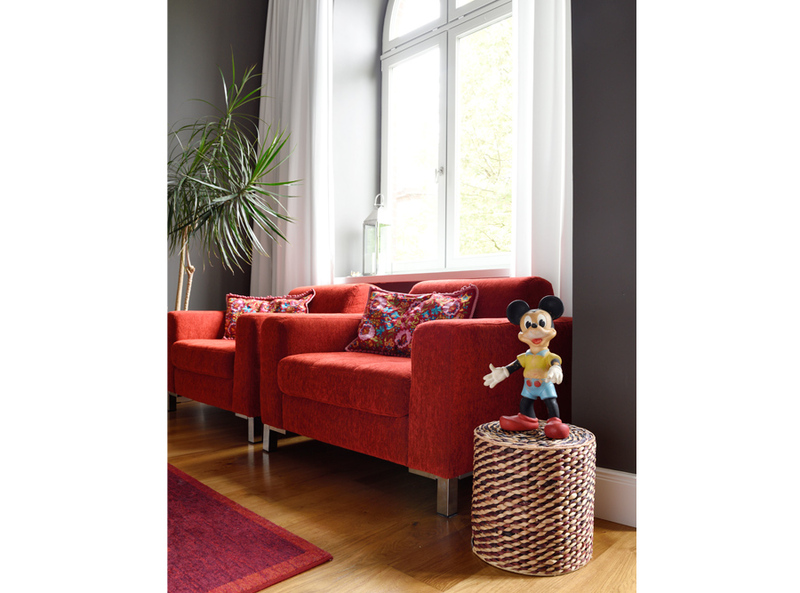 The tones of red were reapeated as soon as you reaching the sitting room and gave the whole entryway and lounge space a harmonious feel. Testing out the bedroom lighting. Vintage style candlestick or modern simplicity. Which is better? In the bedroom we wanted a little boudoir feel but not too over the top. We went for the one-wall wallaper trick and my client chose an exquisite gold and cream baroque style paper with a lovely sheen. We then toyed with the idea of either her large candlestick light which stood originally in the dining area or a simple modern floor lamp to create that infamous Grace & Holmes old-new, modern-antique fusion. I think she likes both! After that we experimented with accessories. 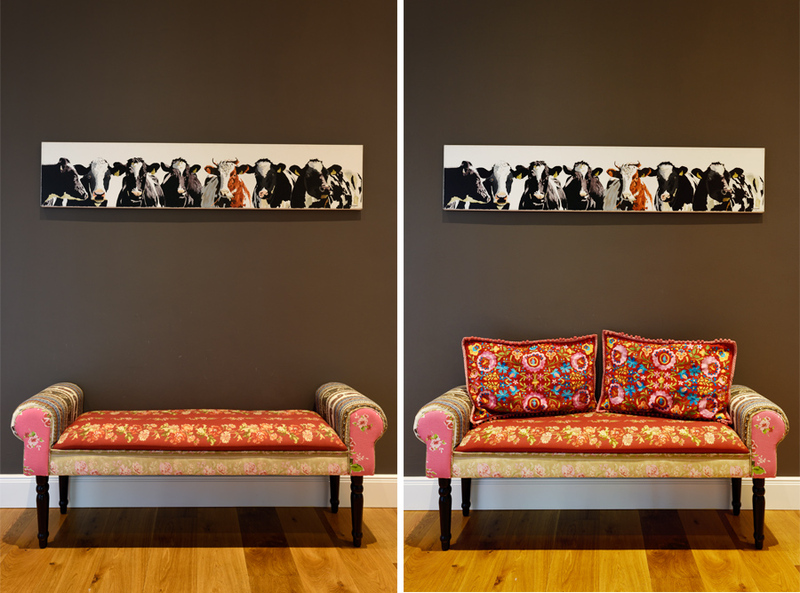 Switching cushions, artwork and decor from room to room. 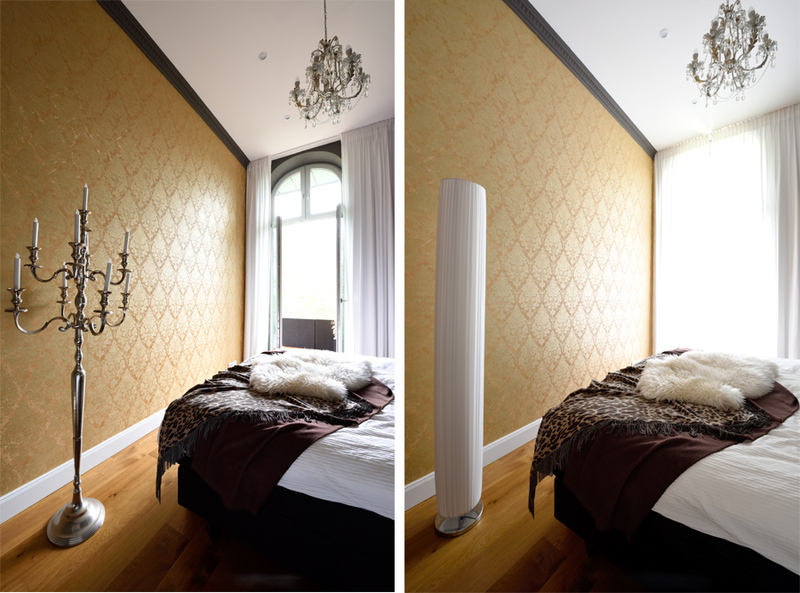 It's surprising how different a room can look when you change your perspective. Be brave I say! My clients (and I) loved the mix of elegant greys, glamourous gold and humour using wallpaper, mouldings, artwork and vintage pieces. And of course the G&H fusion touch, mixing antiques and contemporary styles to create that unique and personalised space. Don't be like the rest of them darling!